One of the things that I loved about my parents while growing up was the way that they gave me free reign to decorate my bedroom however I liked. If that meant rearranging my furniture every month, fine (and I did). 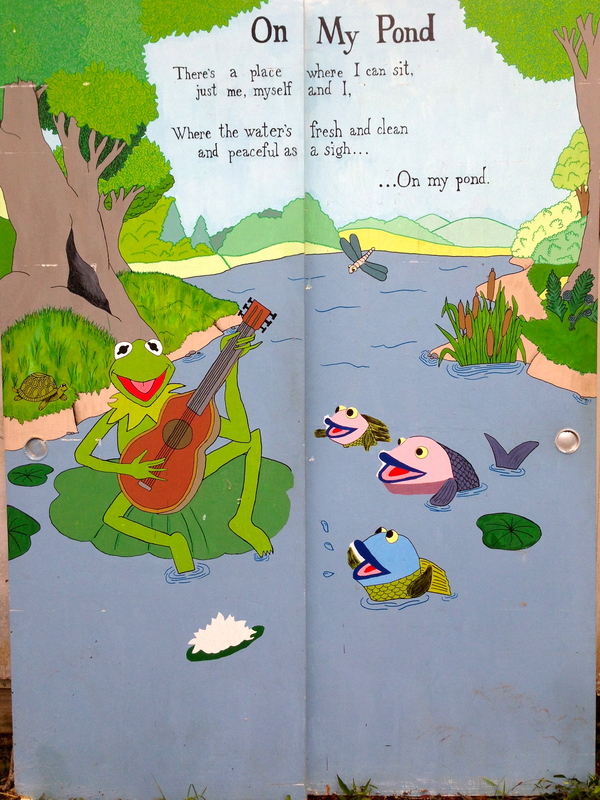 If that meant painting a giant mural of Kermit the Frog on my closet doors, no problem! So I did. If that meant hanging up pictures of Jonathan Brandis and Arnold Schwarzeneggar on my walls, more power to me. Sadly, I also did this… please don’t ever ever bring it up, it’s not a memory I’m proud of. Yikes. The closet doors I painted in high school… I ran out of paint and never finished the bottoms… oops. I love my parents for taking it with them after they sold the house – it meant a lot to me. Now don’t get me wrong, I wasn’t allowed complete artistic liberties. I remember one time (I think I was about 6 or 7) I had the bright idea to label my dresser drawers. Yes, I was an organized child. The problem was that I decided to label the raw wooden drawers with Mr. Sketch markers. The top two drawers were written so nice and neat, but by the third drawer down it started to sink in that I might actually get into some major trouble for what I was doing. So unfortunately the word “nighties” started out as nice as the labels on the top two drawers, but by the “ies” of the word the letters were so tiny you needed a microscope to read them. Drawer four never got labeled. My parents weren’t upset about it, at least as far as I remember. There’s a chance I may have blocked out that memory. But I remember other things about my room… the bakers rack that I thought would make a beautiful computer desk, the ceiling fan blades that I covered with masking tape and colored rainbow stripes on so that when it was on there would be a beautiful spectrum of colors over my head, the bankers lamp I simply had to have, and the dozens of times I spent a weekend rearranging furniture. My room was my world – my safe place – mine. One of the coolest things about my room growing up was what was hung on the ceiling. I’ve always had a love for mylar balloons, and whenever I received one I’d keep it until it was deflating, drain the helium out of it, and tape it up on my ceiling. 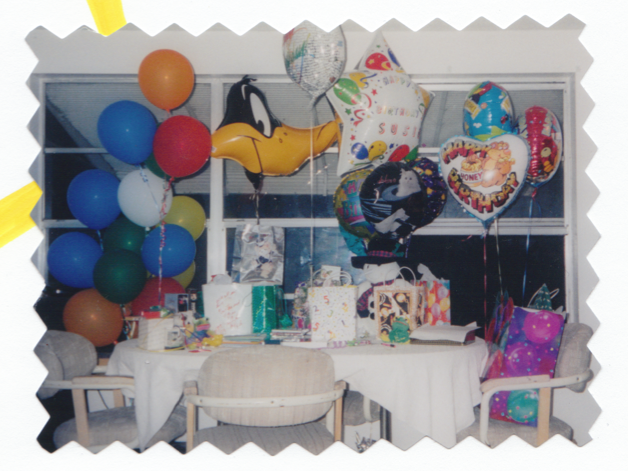 It started out with three regular-sized balloons right above my bed in 9th grade, but by my sophomore year I had more friends and WAY more balloons. Some were normal, some HUGE, and one was even shaped like Daffy Duck. By the end of high school my ceiling was pretty much fully covered. Some of the balloons that had the honor of jazzing up my ceiling. It’s always been a no-brainer to me that I would allow my children the same freedom when it came to expressing themselves in their rooms. I decorated the girls’ nurseries, of course, (If I had let them design it then Emily’s would have looked a stuffed animal explosion and Julia’s would have looked like a Jackson Pollock painting except made of spit-up) but that’s where I pretty much left off. When she was nearly 4 we let Emily choose her new bedding, as well as what she wanted me to paint for her border. She did the art on the walls herself, and told me that she wanted a butterfly hanging from the ceiling over her bed. Of course, I complied. Both girls just had bedroom makeovers (can’t wait to share the photos!) now that they are 7 and 2, and both were involved in some of the decisions that went into their rooms. I’ve told Emily that when she’s 10 she’s going to get another makeover – this time we’ll be letting her choose the wall color(s) – and I have a feeling that she’s going to have quite a few opinions on other things she wants! In the meantime, I’m enjoying reminiscing about my old bedroom. While out shopping with my mom recently we came across this ornament. It reminded us both so much of my old bedroom, and she bought it for my Christmas Tree. 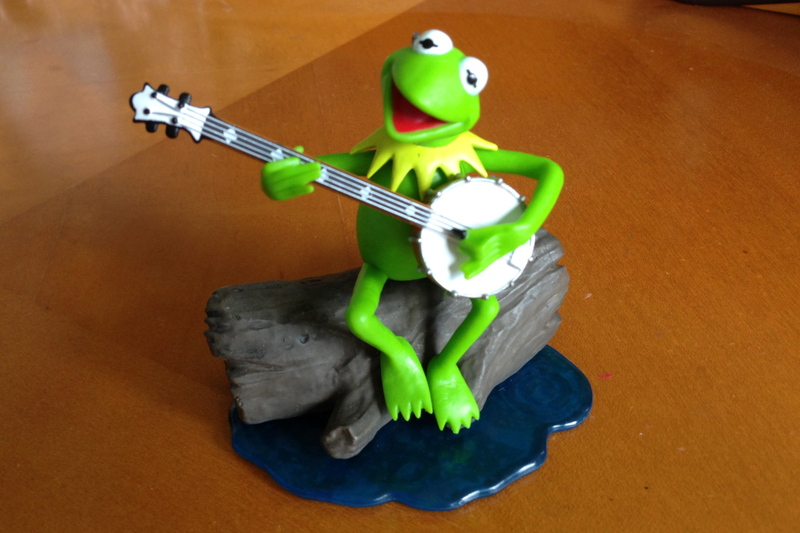 My new ornament – if you push the button Kermit sings, “Rainbow Connection.” Love. Thanks, Mom & Papa Bear, for letting me express myself so freely growing up. Those memories are a constant source of smiles for me. We have always enjoyed your creativity and never wanted to stifle it. Along with your sense of humor, we were always anticipating the next project. We were never disappointed.